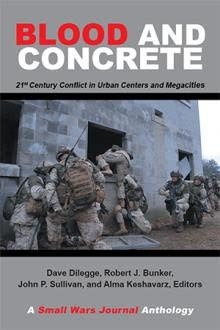 New and now available at Amazon - Blood and Concrete: 21st Century Conflict in Urban Centers and Megacities provides a foundation for understanding urban operations and sustaining urban warfare research. This Small Wars Journal (SWJ) Anthology documents over a decade of writings on urban conflict. In addition to essays originally published at SWJ it adds new content including an introduction by the editors, a preface on “Blood and Concrete” by David Kilcullen, a foreword "Urban Warfare Studies" by John Spencer, a postscript “Cities in the Crossfire: The Rise of Urban Violence” by Margarita Konaev, and an afterword “Urban Operations: Meeting Challenges, Seizing Opportunities, Improving the Approach” by Russell W. Glenn. These essays frame the discussion found in the collection’s remaining 49 chapters. Blood and Concrete continues the legacy of Small Was Journal's coverage of urban operations, conflict and combat. - Dave Dilegge, Robert J. Bunker, John P. Sullivan, and Alma Keshavarz, Editors. Beach Detonation - A Marine conducts a demolition test in Ternate, Philippines, 6 April 2019, during Balikatan, an annual U.S.-Philippine military training exercise that focuses on humanitarian assistance and counterterrorism. Photo by Marine Corps Lance Cpl. Angelo Sagum. "Small wars are operations undertaken under executive authority, wherein military force is combined with diplomatic pressure in the internal or external affairs of another state whose government is unstable, inadequate, or unsatisfactory for the preservation of life and of such interests as are determined by the foreign policy of our Nation." Small Wars Journal publishes original works from authentic voices across the spectrum of stakeholders in small wars. We also link you to relevant goings on elsewhere. Login with your SWJ Username to comment, or Register, it's free. You can start your own threads in the Small Wars Council discussion board, but note that the board requires a separate Council Username. Follow SWJ on Twitter @smallwars. Small Wars Journal just reopened its Amazon Associates account and can receive a percentage of each purchase you make through this portal: Shop Amazon and Support SWJ - thank you very much! This article explores how state actors are using advanced software development tools and artificial intelligence (AI) to invent and perfect new deception capabilities to fool both people and machines on the virtual battlefield. It examines intelligent computer vision systems and their capabilities to support state-sponsored hybrid warfare. In the future, more countries are likely to serve as theaters of great power competition. Conflict will arise in those countries where it didn't exist before, and will deepen in those where it already exists. In both cases, instability will grow. The use of proxies will mitigate the potential for direct great power conflict, but tensions will rise as the world becomes smaller and opportunities for conflict grow. Preparations for future small wars described in the JOE 2035 must account for stability operations, FHA and peace operations, and counter-insurgency and counterterrorism operations. Viewing these types of small wars as distinctly separate and mutually exclusive is a flawed perspective; the world is an interconnected place and the types of small wars the joint force may encounter in the future will often occur simultaneously and as a result of one another. This research seeks to determine how cyberwarfare applied through the lens of operational art contributes to cross domain synergy within the context of multi-domain battle. Cyber and EW capabilities are critical to enable operational commanders the opportunity to create temporary windows of advantage, shape the deep fight, control tempo of multi-domain operations, and arrange cyber effects in time and space to achieve strategic objectives. The study needs to start with a baseline of how to defeat terrorists and insurgents. It can’t accept at face value the hopes and aspirations of American policy makers and field commanders as they entered the War on Terror. It needs to measure their strategies and tactics against proven success. The past two decades in the Indo-Pacific region have resulted in remarkable change across the terrorist landscape. Attacks and deaths are down, but jihadist ideology and threats persist. The Indo-Pacific states of India, Pakistan, and the Philippines consistently remain among the “Top 10” countries affected by terrorism according to the Global Terrorism Index report. If there was any doubt whether or not 2019 would see a continuation of the deadly trend, this year’s bombing just days before the Bangsamoro Organic Law plebiscite, the Pulwama terrorist attack in India, the breakup of an international terrorist cell in Malaysia, and the New Zealand mosque shootings all serve to remind us that extremism remains at our front door. To a large extent, the question of whether remote warfare waged by RPAs is ethical depends on if one believes riskless war is dangerous, destructive, and overly easy. The ethical issues of asymmetric risk, moral hazard, and destructive behavior are difficult considerations to face, but necessary to reconcile. Ultimately, despite these concerns, the RPA is an ethical instrument of air warfare which leaders should certainly take advantage of, if they do so judiciously as they should with any weapon. U.S. Department of the Treasury Report: "Action Targets ISIS Financial Facilitators and Money Transfer Company"
Imagine this: As you drive down the highway at the speed limit in the right lane, another car races past you on the left then veers into your lane without warning. The other car then slows down until it is just feet in front of you, forcing you to make a quick decision to slow down, change lanes or even swerve off the road to the right to avoid a collision. Now imagine the same scenario involving two satellites orbiting 22,000 miles above the earth and traveling at 6,800 miles per hour. This article is informed by the author’s experience adapting his previous fieldwork studying counterinsurgency in Colombia into lecture content for the U.S. Air Force Special Operations School’s Contemporary Irregular Warfare Course. "Before he spent five years in prison for murdering a suspected al-Qaeda detainee, Michael Behenna was a rising military officer from a prominent law enforcement family." "Ever since Russia annexed Crimea from Ukraine and sponsored separatists in the Donbas, Eastern Europe has collectively wondered: 'Where will the Kremlin strike next?'" "People in Sri Lanka are experiencing a second day without access to some of the most popular social media sites within the country, after the government shut down the services in the wake of a terror attack that killed nearly 300 people and injured hundreds on Easter Sunday." "Authorities here said an international terror group likely supported an obscure local Islamist group in carrying out a series of bombings that killed at least 321 people on Easter Sunday, weeks after the government had received warnings from the U.S. and India about a possible attack." "Sri Lanka on Tuesday described the devastating string of bombings on Easter that killed 321 people as a response to the attack on two mosques in New Zealand last month." "Eight separate bomb attacks on churches and luxury hotels on Easter Sunday left 290 people dead and another 500 injured. A day after the coordinated explosions, which mostly targeted Sri Lanka’s capital city of Colombo, the names and stories of those who died are beginning to trickle out." Continue on for an update concerning the terror bombings in Sri Lanka. "The White House said Friday that President Trump, in a phone call with renegade Libyan general Khalifa Hifter, praised Hifter for fighting terrorism and protecting Libya’s oil, comments that were far afield from the administration’s stated policy on Libya." "Explosions shook the Libyan capital Tripoli late Saturday after an airstrike, residents said, in an escalation of a two-week offensive by eastern forces on the city held by the internationally recognized government." "A series of coordinated explosions struck three churches and two hotels in Sri Lanka on Easter Sunday, killing at least 75 people and injuring more than 200. Blasts took place in churches in the cities of Colombo, Negombo and Batticaloa"
"Suspected Islamic State militants attacked a government building in teeming central Kabul on Saturday, killing seven and triggering a gunbattle with government forces that sent terrified workers scurrying for safety and left others huddled in their offices awaiting rescue." "Suspected militants attacks a government building, triggering a gunbattle with authorities and killing seven ." "On Thursday, the Islamic State’s news agency claimed the group’s first attack in the Democratic Republic of Congo, stating that its soldiers had assaulted a military barracks in the area of Beni, killing eight people." "In July 2013, a broadcaster affiliated with the Islamist group Hezbollah posted a threatening video on Facebook, YouTube and Twitter. It featured gun-toting militants practicing an ambush to kidnap Israeli soldiers. The message: This is how we kill you." "A militant band of women loyal to the Islamic State is terrorizing others who fled the battlefront for this sprawling camp in northeastern Syria, demanding they adhere to the strict codes once enforced by the group and creating a vexing problem for the Kurdish-led forces controlling the site."